1874 autograph album with inscriptions acquired by owner Mary Carmichael while she was a student at the National Normal School at Lebanon, Ohio. Inscribers hailed mostly from Ohio, Indiana and Pennsylvania. 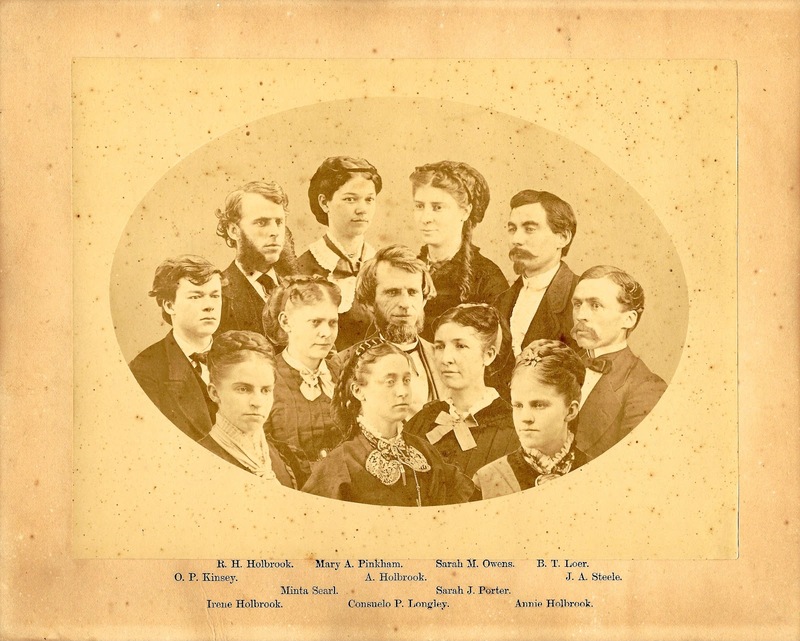 Reader "Griff" has given permission for the use of a photograph of Alfred Holbrook, center, first principal of National Normal School, and several others from the school, a few of whom, including Alfred Holbrook, inscribed pages in the album. Refer to the list of inscribers at the end of this post. Sadly, there are no ownership, presentation and/or title pages present in the album, nor have any of the inscribers expressed a kinship to her. The only clues I have to Mary's identity are the pages inscribed "to Mary" and to "Miss Carmichael" and to the page inscribed by Mary's roommate "Lib". If only Lib had been more forthcoming with her personal information. The page below was inscribed by M. M. Highley at National Normal School in 1874. The page below was inscribed by Alfred Holbook, a Connecticut native who was the first principal of the National Normal School. The Anna Holbrook who inscribed a page was presumably his daughter, perhaps a classmate to Mary Carmichael. Harp Van Riper inscribed facing pages on January 24, 1874. Several sets of roommates inscribed facing pages, including Lizzie Reed of Carrolton Station, Ohio, and Mary Shriver of New Philadelphia, Ohio. Below, roommates A. L. Ellis of Chillicothe, Ohio, and Mrs. Hattie Ellis of Chillicothe, Ohio. If you have a theory as to the identity of album owner Mary Carmichael or if you have information on any of the inscribers, please leave a comment or contact me directly. Hattie Butts of Gettysburg, Ohio, inscribed on April 1, 1874. Her page has the word "Room" at the top, which corresponds to the word "Mates" at the top of the right facing page, which indicates that Hattie and Lulu Naylor were roommates. Hattie also stamped her name on a page. J. M. Cooper of Germantown, Ohio; inscribed at National Normal School on April 25, 1874. Roommate of D. P. Heffner, who inscribed the right facing page. A. O. Creager of Dayton, Ohio; Mary's classmate, perhaps at National Normal School at Lebanon, Ohio. "Ever remember the club at 105 Mechanic St."
Emma Elliott, middle initial possibly G., of Dublin, Indiana; inscribed at National Normal School at Lebanon, Ohio, on August 12, 1874. Mary Carmichael's roommate. A. L. Ellis of Chillicothe, Ohio. The word "Room" at the top of the page, which goes along with the word "Mates at the top of the right facing page indicates that A. L. Ellis and Mrs. Hattie Ellis were roommates. Mrs. Hattie Ellis of Chillicothe, Ohio. The word "Mates" at the top of the page, which goes along with the word "Room at the top of the left facing page indicates that A. L. Ellis and Mrs. Hattie Ellis and were roommates. Carrie E. Gring of Shrewsbury, Pennsylvania; inscribed at Lebanon, Ohio, on July 30, 1874. "I shall ever remember your bright eyes and hearty, merry laughter. Give me a thought occasionally." Lulu Naylor of Gettysburg, Ohio. Her page has the word "Mates" at the top, which corresponds to the word "Room" at the top of the left facing page, which indicates that Lulu and Hattie Butts were roommates. Lizzie Reed of Carrolton Station, Ohio; inscribed at National Normal School on August 8, 1874. The word "Room" at the top of her page goes along with the word "Mates" on the right facing page, to indicate that Lizzie and Mary S were roommates. Charles A. Shinn - not sure of surname - of Selma, Ohio; inscribed at Lebanon, Ohio, on June 10, 1874. He inscribed at least one other page and shared a page with W. R. Smith. Mary Shriver of New Philadelphia, Ohio; inscribed at National Normal School on August 8, 1874. The word "Mates" at the top of her page goes along with the word "Room" on the left facing page, to indicate that Mary and Lizzie Reed were roommates. J. C. Smalley of Hillsboro, Indiana; inscribed at National Normal School on June 22, 1874. Presumably Josiah C. Smalley, who may have been the brother of Thomas J. Smalley, who inscribed the right facing page. T. J. Smalley of Hillsboro, Indiana; inscribed on June 22, 1874; presumably a student at National Normal School. Presumably Thomas J. Smalley, brother of Josiah C. Smalley, who may have been the J. C. Smalley who inscribed the left facing page. Harp Van Riper; inscribed on June 24, 1874 [or 1877]. He also inscribed the right facing page with a beautiful bird and insect design. Wonderful! I've incorporated the photograph into this post - many thanks. And thanks for clearing up the identity of Oliver Perry Kinsey! Thanks! Love the photograph of Mr. Holbrook and his home.